Pro Powder Blushes create a radiant glow when swept across cheekbones and dusted lightly on nose and forehead. Sweep a small amount of blush over eyelids to make eyes appear vibrant and alert. These powder blushes are highly pigmented, vegan, and cruelty-free. Choose between shades in cool or warm undertones. 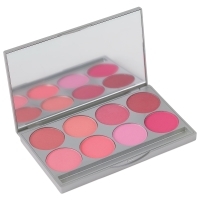 Each palette contains eight full-sized 37 mm pans of pressed powder blush in a magnetic silvertone case with mirror. The magnetic blush pans can be easily popped out and replaced with refills. 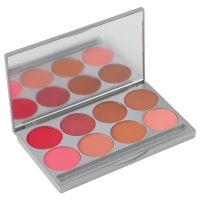 Cool Palette — Includes all of the cool blush shades plus the two lightest neutrals. Colors include Mauvaliscious, Dusty Rose, Raspberry Shimmer, Sparkling Wine, Coral Cocktail, Healthy Glow, Classic Pink, and Radiant Rose. Warm Palette — Includes all of the warm blush shades plus the darkest neutral. Colors include Candy Apple, Shiny Penny, Cognac Kiss, Hint of Blush, Blushing Bride, Sunset Peach, Cinnamon, and Velvet Peach.